One of the more interesting claims made for ‘shared space’ road designs is that they will serve to improve driver behaviour, by making those sitting behind the wheels of motor cars think for themselves, and to respond to stimuli, rather than driving on autopilot. In the absence of clear rules about how they should drive – give way lines, traffic lights, and so on – motorists will be forced to think carefully about how they should be driving. motorists would still have full access to the road, but it would be like driving through a campsite. “You don’t need signs everywhere on a campsite telling you to give way or stop or slow down, because its blindingly obvious what you need to do,” he said. there is a degree of uncertainty, intrigue, and as soon as the driver’s brain is engaged, the speeds drop, and the responses to the unusual, the unexpected, the individual, become immediate and responsive, rather than assumed. in urban environments, and even in suburban environments, the principle idea – the idea that negotiation with other road users is a safe and responsible and adult way forward, it seems to be of pretty universal application. As I have said before, the implication of comments like these is that it is the rules themselves that generate bad behaviour. Strip them away, give people the responsibility to behave like mature adults – and they will behave like them. Conversely, so the argument goes, if we use ‘nanny state’ principles, and treat people like idiots with signs about how they should drive, and where they should park, and they will behave like idiots. Unfortunately, I can’t see any reason why the minority of drivers who behave like idiots on ‘conventional’ roads will cease to do so when they drive through schemes with an absence of rules. They will continue to behave like idiots. In the above video, by cycleoptic, the driver of the Mini enters and exits the ’roundabout’ on Exhibition Road on the wrong side of the road. The lack of clarity in the design has plainly not stopped his or her stupidity – indeed, it may even have given licence to driving in this manner. Without rules governing how drivers should behave, what’s to stop them doing things like this? Rather than ‘uncertainly’ and ‘intrigue’ about the right way to behave generating better behaviour, it may be the case that that the very same uncertainty can be exploited by those in a hurry. If it’s not particularly clear that the circle in the road is a roundabout, why not just drive around it the wrong way, cutting across the ‘pavement’ as you do so? Similarly this Mercedes driver, frustrated with a long queue on Exhibition Road, is driving down the ‘wrong’ side of the road. Not pleasant for anyone who might happen to be cycling in the opposite direction. But with an absence of rules, it becomes harder to claim that this driver is doing anything wrong. On a flat, uniform surface, without markings, what’s to stop you just driving past stationary traffic, beyond simple common courtesy? 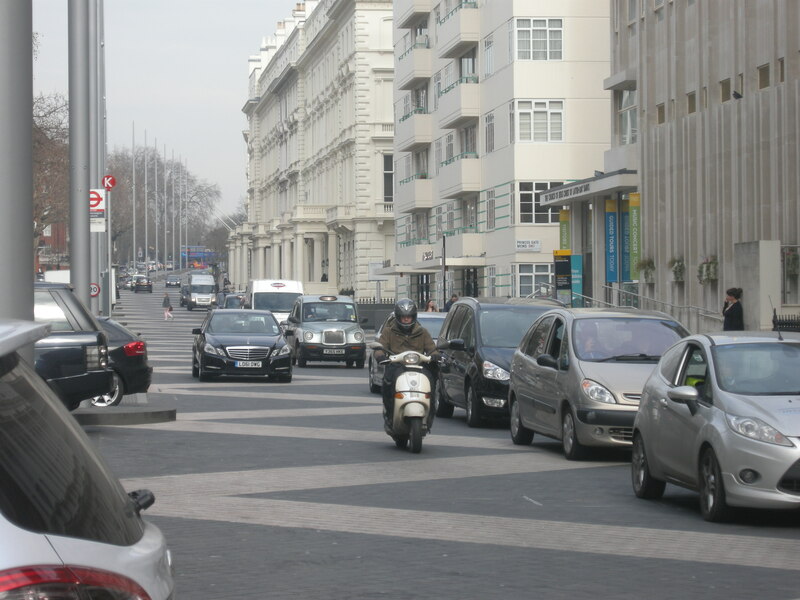 Granted, it may only be a minority of drivers who behave in this way, but given that shared space is reliant for its success on vulnerable users being willing to mix and interact with motor traffic, and not to just meekly stay out of the way, the implications of bad behaviour are quite serious. It only needs one in a hundred – or one in a thousand – drivers to act aggressively, or to take shortcuts, for people to become reluctant to share space with the other 99, or the other 999. In a society that is still heavily motor-dominated, we should acknowledge that the libertarianism and personal responsibility offered by shared space may not be quite as uniformly positive as it might first appear. This entry was posted in Shared Space, Subjective safety. Bookmark the permalink. This may be true. But what is the solution? Do we accept that we should make our roads and environment areas where signs and rules dominate, and the police enforce the rules; or are they better when they create a shared environment where people interact? If this behaviour exists anyway, then are shared streets exacerbating an existing problem, or is the issue the same? Is there an advantage in that shared streets encourage us ALL to participate in the issue, instead of relying on multiple CCTV and ANPR cameras for the police to identify and prosecute those who are behaving badly? No easy answer, but I think the way forward is to remove more motor traffic from these kinds of environments. Traffic volumes on Exhibition Road are just too high for it to function effectively (contrast with the southern section by the tube station, where very few motor vehicles are passing through). Where you can’t reduce motor traffic volume, you have to design more effectively to separate pedestrians and cyclists from motor vehicles, and to restrict the potential for bad driving, through design. Once you have a certain number of people competing for room to move around by whatever means, there’s a huge benefit in having some clearly defined conventions about how we use the space, and at some point those conventions turn into harder rules – because, as pointed out, it only takes a minority of selfish or ignorant people ignoring those conventions to undo the benefit. Similarly there’s an economy of scale in nominating a few people to ensure the majority of road users stick to those rules. So I have no problem with signs and rules and police. I’m no sheep but it’s nice to have clear consistent conventions in some places. We all stay on the left, we stop at red lights, etc. And if someone decides they want to drive on the right, and I don’t like it there’s not much I personally can do about it, especially since I’m usually on a bike, so I’m quite happy with police if they’re acting fairly. We all agreed on a highway code for a reason. This keeps things simple, except for where it doesn’t, perhaps because we have a road which too many people are trying to use for too many different purposes at the same time. In which case even clearly defined rules can’t smooth out the bumps – they just complicate matters further – and we need to pick the most important or most useful purpose for that road and concentrate on facilitating that and finding somewhere else for the other users, or maybe giving them better options in some other way. As for the campsite analogy, that’s ridiculous. A campsite is not on the way to anywhere. It has a clear purpose which is camping, with people relaxing and kids running around. That’s why it’s “blindingly obvious”. Campsites only includes cars minimally, if at all, and you’d have to be a proper wally to drive fast, although it does still happen sometimes, which is why even campsites do sometimes end up with rules and signs – “5mph speed limit”, or one way routes where everyone goes clockwise round the site. Busy campsites – think festivals – often separate the parking from the camping. Not only was the Mini driver on the wrong side of the road, they were indicating left as they approached you, only to steer right in order to pass you. What incompetence. That ‘rules cause the problem drivers’ is a bogus argument. Driving is clearly not an experience that has a civilising influence. Giving someone a car in the UK is like giving them a gun in the Wild-West. It greatly facilitates the reckless, the stupid, the incompetent and the criminal to intimidate, bully and to kill. Calling SMIDSY is like saying, ‘I didn’t know it was loaded’, the devastating impact on the victim is somehow rendered irrelevant or impossible to avoid, as if it never happened. The perpetrator is freed of all responsibility, and ‘punished’ accordingly, with a metaphorical slap on the wrist. It has been known since the very first cars that cars encourage their users to engage in vehicular terrorism – the bullying of pedestrians. Even Rudolph Diesel in 1905 revelled in such behaviour. This is Rudolf Diesel’s almost euphoric description in his diary in 1905 of a deliberate abuse of humanity by a car (see Sachs, 1992, p. 26). Looks like the Mini had its hazard lights on which, as we all know, makes any bad behaviour acceptable. The problem with shared space is that it is conceived and delivered by people who are probably quite nice and civilised but who (possibly through lack of interaction) are naive and don’t appreciate that there are a lot of evil brain dead zombies lurking behind the wheels of one ton death machines out there! The evil brain-dead zombies are only like that when behind the wheel of a powerful car. Get them out of the car and they transform into ordinary pleasant pedestrians. Very confusing. The problem is not so much the shared space, as the types of vehicle that are allowed to use it. I’ve been watching pedestrians on pedestrian crossings recently, and it’s clear that there is no need for a “keep left” rule, as people walking will quite naturally be able to avoid bumping into each other. If they do very occasionally bump, usually to over-compensation on both sides, this is a very minor problem, usually laughed off with lots of “sorry!” and smiles. Similarly if you watch large groups or streams of cyclists, you do need some rules like “keep left” but you don’t really need to enforce lane discipline or speed limits (and in the UK speed limits only apply to motor vehicles). Cyclists need a few more rules because they’re going a bit faster, and head-on collisions are thus more likely and more serious. There was a comment on needing to indicate when cycling in Copenhagen rush-hour, to enable others to let you make turns, but this doesn’t need to be enforced because not-indicating doesn’t cause serious problems. Then we move to heavy motor vehicles that can travel much faster than a human can run. They need more rules because speeds are higher and reaction times the same, and because the consequences of collisions are much higher (expensive, if not also very dangerous). Then we have heavy goods vehicles, that have yet more rules: lower maximum speeds, restrictions on where they can go. These rules are needed because of the much-larger consequences of the inevitable occasional collision. Finally we have railway trains and aeroplanes, where the rules are extremely strict and well-enforced. That’s because they’re very fast and very heavy. * Works very well indeed for just pedestrians. * Works OK for pedestrians+cyclists so long as there’s enough space and cyclist flows and speeds are lowish. * Works OK for pedestrians+cyclists+cars so long as the cars are very low in number and are limited to speeds no more than 20mph. * Doesn’t work very well if you add heavy lorries, which add significant danger even at slow speeds. * Unthinkable if you wanted to add trains or aeroplanes, even if they were limited to 20mph maximum. Hmmm… perhaps shared space works if the total weight of the faster/heavier vehicles is matched by the total weight of the more vulnerable road users? So bikes share OK with pedestrians if there are slightly more pedestrians than cyclists, cars will share OK with pedestrians if the ratio is at most 1 car per 20 pedestrians, lorries would be OK at most 1 lorry per 150 pedestrians, and so on. You make some good points. I like the total weight theory, although I’m not sure about the construction lorry in a crowd of people! I’ve noted that “shared space” is a term used inconsistently, sometimes resulting in confusion. We need to be clearer who is sharing and how. For instance Exhibition Road (all modes of transport) is quite different to a path through a park where cycling is allowed, but both are “shared space”. I’ve read that in the Netherlands busy junctions have all-directions-green traffic light phases for cyclists in the same way that we often do for pedestrians. It saves time and cyclists are unlikely to crash into each other – perhaps people are more careful when they aren’t in metal boxes. And one that doesn’t happen. I’ve done the odd large scale “running race” (10k, half marathon, etc) and you often get situations where faster runners start further back for some reason, or slower runners start towards the front. This can cause problems as people wind in and out of each other trying to pass and squeeze through gaps. I’m surprised there isn’t an race etiquette that people who discover they’re running slower than those around them (on average) stay left and vice versa. Perhaps everyone wants to think they can go faster and no-one likes to admit that they’re the one getting in the way! I wonder whether in fact it is possible to sanction a motorist for driving on the wrong side of the road. Certainly, one of the reasons why I failed my driving test at first attempt was not “keeping to the left in normal driving” – and I was only pursuing classic VC tactics, had I but known it, and driving the car well out from the kerb! I wonder whether the mini driver behaved like that out of incompetence or stupidity or – while quite possibly being incompetent and/or stupid as well – had spotted an empty parking space and was hell bent on grabbing it before some other bugger got there. Certainly, disputes about parking spaces do occur and can occasionally turn ugly. My issue with car parking, especially on-street, is that apart from all the other sins it commits eg taking away space which could be used for a cycle lane, there is a near-linear mathematical equation between availability of parking spaces and traffic volumes which turn into congestion, pollution, road danger etc. To civilise a city, you have to impose strict restrictions on the quantum of parking, as well as charging a price for it which fairly reflects the burdens it imposes on other road users. Clearly this is not happening in some parts of central London, notably in Westminster, which is believed to make a substantial surplus on its parking account which no doubt either directly or indirectly subsidises other council budgets and enables the Tory administration to maintain an artificially low council tax precept. Local authority finance rules don’t permit parking surpluses to be used to pay for non-transport related expenditures, but that doesn’t prevent them using them to pay for roads maintenance etc instead of drawing on the general fund for such things. 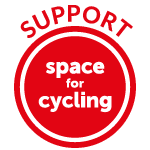 In my view, Westminster should perhaps be the next target for cycling activism, now that we have (hopefully) achieved a paradigm shift at TfL, and much of that, I would suggest, should be around the permeability of the side streets and making space for cycle contraflow by taking space away from car parking. Following carmathenbaywatcher’s comments, it seems to me that many street designs, including this, comes from architects who focus on the aesthetics of the design and are either unaware of, or actively ignore, the practicalities. They should consult engineers, psychologists and social scientists as well, and perhaps that way they would learn what not to do. My granny was moved out of her back-to-back house in central Sheffield in the 60s, into some arcadian vision of deck-access maisonettes and tower blocks, dreamt up by a middle class professional architect who simply had no concept of how working class communities lived – deprived of that streetscape where you open your front door to see who else is on her doorstep and available for a gossip, they all absolutely hated it. Similarly, an architects’ firm – street architects, but architects all the same – conceived the Cheapside and Ken High St designs thinking that bicycles would make a handy way of imposing traffic calming on streets where they intended pedestrians to have a much better environment. Had they read the TRL study on cyclists attitudes to road narrowing schemes, perhaps they would have approached them differently. Whilst the driver of the mercedes shown is behaving in a somewhat antisocial manner, as you say the lack of markings etc. seem to permit this. Hopefully (s)he would move over to the conventional side of the road if met by an oncoming cyclist/ vehicle. The mini driver on the other hand IS disobeying traffic signs. Cycleoptic’s video shows a daylight view of the route through the junction the mini took, I suspect to further illustrate this truly shocking driving. This shocking, dangerous and illegal manoeuvre seems to have been triggered by an impatient desire not to be delayed by taxi performing a u turn. I think the area of vehicles doing u turns is a bit of a grey area. The taxi in this case though is clearly protected (legally at least) by the keep left sign. The cyclist is of course in the right too, but clearly this would be little use if he were to be hit by a vehicle at speed. I would be interested to know the traffic flows on various sections of Exhibition Road. As you point out the southernmost section (below Thurloe Place) is clearly the quietest. I suspect the northernmost section is the busiest with many drivers turning right from Exhibition Road into Prince Consort Road (hopefully with virtually none taking the line the mini took) or the equivalent turn in the opposite direction (left out of Prince Consort Road onto Exhibition Road). The theory of Shared Space fails because, as Paul Gannon once said, it ignores the facts of power and status on the roads. It is a fantasy to claim that pedestrians, cyclists and drivers can interact with one another on an equal, democratic basis of negotiation, as the Shared Space proponents claim or imply. This lack of equality or democracy become most acute when dealing with impaired groups like the disabled and blind, and it is no surprise that their representatives have been the main opponents of the theory, not cyclists. Those who currently have the guts to cycle on our roads are bold people have much less to loose from the introduction of shared space than some others. I can’t quite work out whether the proponents of shared space are pursuing a deliberately regressive agenda or not. They are intelligent and must be able to appreciate these counter-arguments, but for some reason they have convinced themselves that their concept benefits everyone, when it so patently does not. I think mostly it is not malign, but bound up with personal career advancement and a conceit of being radical or cutting-edge in design. At bottom, I think shared space is a motor-centric theory, thought up by people who are themselves motor-centric. Hans Monderman, inventor of Shared Space, certainly was. He didn’t want restrictions imposed on his racing round the back lanes of the Netherlands in his green Saab. Fortunately, most of the planners in the Netherlands disagreed with him, and those back lanes in the Netherlands that he wanted to drive on have now mostly been taken out of the traffic system for cars, and given to cycling and walking. No need to speculate on people’s inner agendas and motivations, I think. I try to adopt a strategic assumption that everyone is genuine because that makes me look good, and makes me politer – and hence might make it more likely that people will listen. No, I’m not naive – this is a strategic assumption. Interestingly, I did myself change my mind about shared space. It would have been harder to do so, I think, if I’d had any professional involvement in it. Hamilton-Baillie and several others run very small, but very noisy firms promoting shared space. 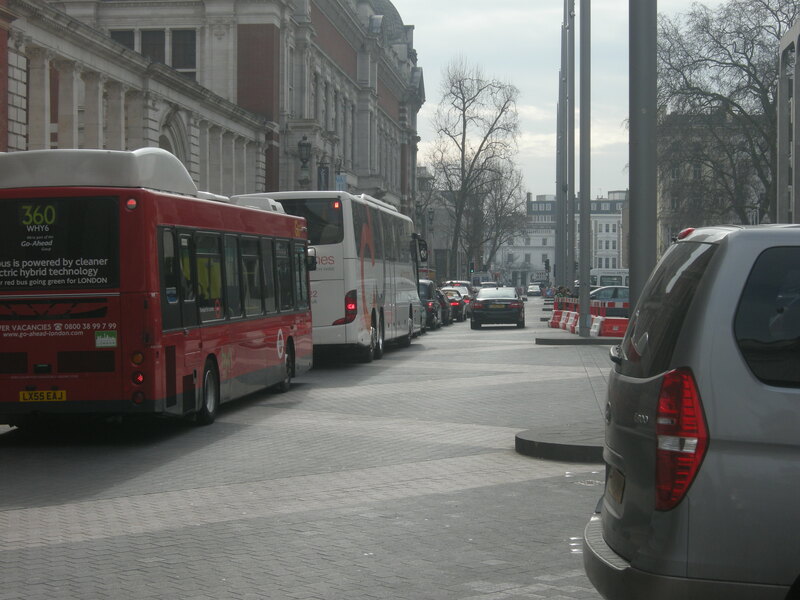 Actually, Exhibition Road is a single-surface set up which for me is far worse when traffic flows have. Not changed. These “single personality” firms are shameless self-promoters always on to the next job. Take Ashford. It has been reported that casualties are down, but people are scared to cross the road – go figure! http://m.bbc.co.uk/news/uk-england-kent-16137988 and http://m.bbc.co.uk/news/uk-england-kent-19065954. The trouble is, a few years down the line and these schemes are old news and the problems don’t get reported. Ashford has many problems with paving (bespoke at that) starting to fail – where are the designers now – they are promoting their next scheme. Interaction between drivers and pedestrians is cited by shared-space people as very important, but research suggests that it is cobblers. In my view, the good schemes are the ones which have removed through traffic and the poor schemes have not. They are also insanely expensive. The trouble is politicians and these design firms love a big scheme and it is always the small, but locally helpful schemes which lose out. I was told last week that paving of this kind, subject to the normal kinds of traffic flow seen in London, with regular pounding by lorries, buses and so on, is expected to start to fail within 1-2 years. It’s a little harsh to say that interaction between drivers and pedestrians is cobblers. The publication you refer to says that people communicate ‘by more subtle signals’ than eye contact. You can quite clearly see interaction in the video posted by Pete Owen below. I totally agree it is the small schemes which are often better but always seem to lose out – both the politicians and the firms have much more to gain by big, flashy & expensive plans. Neither are anywhere to be seen a few years on when the people using the space realise it’s not working. You can structurally design these areas for heavy traffic and heavy flows. It also takes a huge amount of skill from contractors to get it right. Therefore such schemes are insanely expensive (£30m or so for Exhibition Road). One massive problem is when a utility has to dig a hole as this will immediately affect the structure. But Mr H-B will be long gone. In my view the scheme has failed because traffic still dominates the main part. Pete, thanks for this. It’s clearly been very popular. It will be interesting to see if it remains so, and what the long term statistics are. An 88% increase in footfall and reduction in accidents seems like a great start. Others responding to his post say that accidents are reduced because people become fearful of using the space; and that parents would not leave children to negotiate such spaces. I hope there are some follow-up surveys, particularly of those using the space. On Sundays, part of Winchester’s main pedestrianised shopping street is open to through vehicular traffic. It becomes shared space. Last weekend I witnessed a pedestrian uprising. A woman with small children was telling an elderly driver that he shouldn’t be driving there. Other random people who’d been listening to buskers chimed in. That driver was intimidated into a u turn and made a speedy exit the wrong way down a one way street. The next driver beat his retreat in reverse. The only “good” shared spaces are those areas which are too new for people yet to have noticed the problems. Over time, their users become accustomed to them and “might is right” returns. There is a reason why traffic lights were invented – they were needed in order to make people behave once they were behind the wheel of an automobile. Happily, Shared Space has pretty much been abandoned in the Netherlands. I’m not aware of any new ones being built. We do have areas which people sometimes confuse with Shared Space, but which work precisely because they are not really shared at all. These nearly car free areas pre-date Shared Space and they continue to be built because they are genuine success story. It is only when motor vehicles are removed or very severely restricted in their movements that cyclists of all ages and abilities can use the roads. Roads which are busy with a lot motorized traffic are never conducive to high levels of cycling for exactly the reasons demonstrated by this blog post. I love that the theory is based on the assumption that drivers will react to a road design the 100th time they see it as they did the first time they see it. Once people are used to it the idea they will be equally timid (even if they are the first time) seems spurious. They also assume that drivers are inherently good drivers and that all the rules are essentially unnecessary. I wonder why they think the rules were created in the first place? I am impressed by the success of the Shared Space concept in Poynton . The concept defies normal logic which says “we need rules to control people especially car drivers”. The self restraint shown by the drivers is remarkable and what is more appreciable is the respect for the pedestrians. In big cities traffic is a mess and chaotic and very risky. I am wondering whether this work in big cities where there is a constant flow of vehicles from all directions and how does one stop the flow from any given direction to allow the flow from another without some control like a policeman or traffic signals. Before the advent of traffic signals it was common to a have traffic policeman managing the flow of traffic or rather prevent traffic jam. In Mumbai, India, inspite of traffic signals most junctions have policemen to prevent uncivilized drivers from ignoring the signals. In the absence of a policeman the traffic signal does not prevent traffic jam. The unruly drivers become “Road Kings”. All the world over more than a million people are killed every year in road related incidents and most of these are at traffic junctions. I wish all drivers become like Poynton drivers. They should try out the ‘shared space’ concept in zoos. I’m sure all the lions and the antelopes and the bears and the rest will soon learn to ‘negotiate’ the use of the facilities (along with the visiting public) once you remove all the artificial barriers like walls and moats and fences that create all the problems. However, I do like the way that once you view that video YouTube then suggests you watch a US TV interview with Minnie Driver. Clearly she has some questions to answer. The shared space in Coventry is a awful, the legacy of that scheme has reduced the number of pedestrians using that space and reduced number of people visiting City centre, it also looks vile, only been there about 1 year but already looks dirty and congested, reminds me of driving in Nigeria (lived there for 3 years) where you had to bully your way around or you got nowhere! Personally I have avoided those areas like the plaque, and I have experience in both Car and Cycle beyond the norm and will not take either to that area, I even avoid these areas on foot find them horrible unsafe areas and no matter what fairy tail stats the council bring out we can see the destruction that this is causing in the City Centre, seems we want to kill the City centre not help it thrive or even look good. My trips to City Centre have almost become obsolete (and I can walk to City centre in about 7 minutes) since these new shared space ideas came about. Great piece which I just came across. I only visited recently and it does indeed work in two sections and pedestrians definitely do not ‘wander across’ the northern section as some vehicles, when I was there on a Sunday afternoon, were easily travelling at 30mph or faster (wander or cycle in front of a vehicle doing that speed and unfortunately you’re dead). Interesting there are now 20mph speed limit signs, which even if obeyed, I would say is still much too fast for a shared space (home zones for example are designed for 10mph). I was with my 5yr old and I didn’t let go of their hand walking along – it is simply too scary without a kerb which they have been taught to stop at. I certainly wouldn’t let them cycle along the northern section either. I had the same experience in Caernarfon a couple of years ago which has a shared space and few pedestrians walk across it – they stick to the edges whilst cars speed through and park anywhere. As an urban designer I agree with civilising streets and squares, but do question this approach where vehicles can physically drive at any speed and traffic volumes are simply too high for pedestrians or cyclists to have priority.